Social enterprises are missing out on public procurement - here's why. Tussell, a procurement analysis and data firm docusing on public sector tenders, has published results that show 2018 saw a fall of 28% in the number of voluntary, community and social enterprises being awarded public sector tenders. This is the lowest level since 2016. I remember my first public sector bid. It was for a small college refurbishment in the Midlands. Nothing too exciting or significant, a relatively simple surveying commission, but the client had chosen to open up the competition and procure via OJEU. The procurement process was straight forward. Listing accreditations, a few off-the-shelf case studies and answering standard questions on corporate processes got us through the PQQ stage, and CVs, a methodology and views on the project's viability, risks and opportunities formed the tender. There was of course an interview in front of a panel of college estates, procurement, finance and educational staff, but the process was done in 3-4 months and our team were on site within a couple of weeks of award. Now, compare that to procurement activities today. Whether it's the fear of challenge, procurement teams being short staffed or just a result of the continual evolution of procurement activities, bids are a lot tougher. Procurement teams are expecting methodologies, bespoke case studies and extensive corporate information at PQQ stage and despite the drive to use standardised forms such as PAS91 and the CCS PQQ, the option to add more and more extra questions means the bar is raising higher but conversely the cost of bidding is also increasing. Tenders equally are becoming more complex, with marking schemes which seem to be designed to confuse and overly onerous contract terms and liabilities includes in contracts. For a big business, this is manageable. You can employ bid teams, legal teams and commercial teams to navigate complex tenders. You can build a strong content library full of useful starter answers and corporate information. You can employ specialist writers, coaches, behavioural assessment specialists and reviewers to eek out every available point from the tender. But for social enterprises, particularly small businesses, this often is just too high a cost to compete. 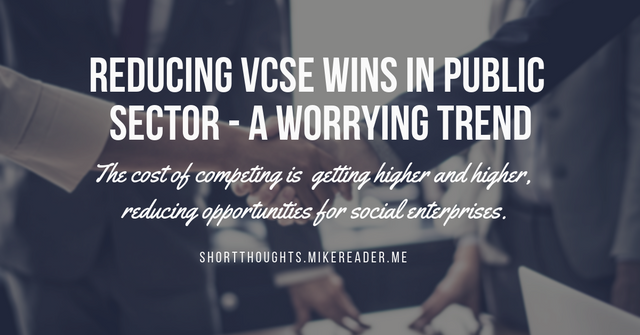 Whilst I understand the increasing scrutiny over award decisions (maybe not those in the Brexit ferry industry though...) means procurement teams are working harder and harder to prove value has been achieved from tender exercises, it's meaning the cost of competing is equally getting higher and higher, reducing opportunities for social enterprises. Whether it's changing the procurement rules for voluntary, community and social enterprises or reducing the complexity and cost of competing that will help reverse a reduction in these businesses being awarded, the drop in contract awards is a worrying trend that needs to be addressed.